The dog days of summer are underway and as everyone starts to spend more time outdoors, pet parents are looking to include their four-legged friends on all the summer fun. Whether it’s outfitting your furry friends with this season’s hottest fashions, equipping yourself with all the essentials for cottage trips or keeping your pet safe during those scorching days, PetSmart has all the products and expertise to ensure they have the best time. · Keep your pets off of hot surfaces as their sensitive paws and get burned easily. · Regularly hydrate your pet, keep them out of enclosed vehicles and in shaded or air conditioned areas. · Be mindful of fleas and ticks. This is the high season! · Pets can get spooked by thunder and fireworks. 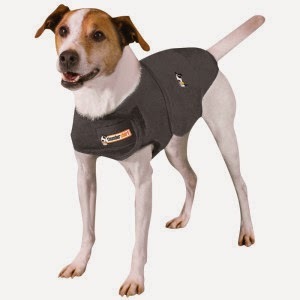 Thundershirts are available that have the ability to reduce anxiety.